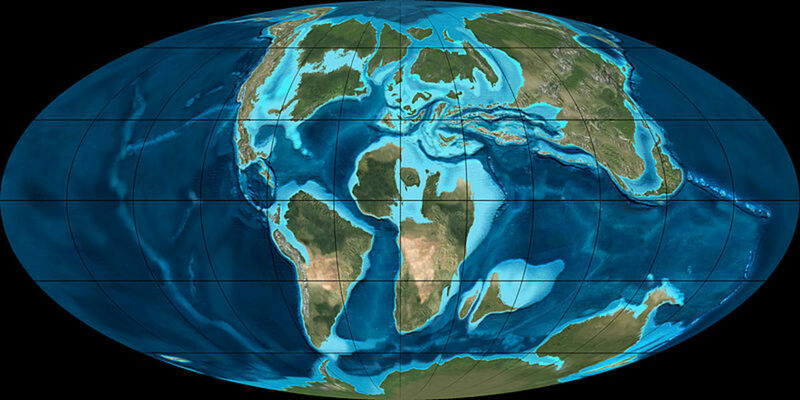 The position of the Earth's continents during the Cretaceous Period. Time: 75 million years ago. Location: Inland sea over Kansas, but in fact many of the predators are widespread throughout the world's oceans. The Shape of the continents: The Earth is starting to look more recognisable, as the continents continue to break up. Africa has moved away from South America and is now heading towards Europe, India is on a collision course with Asia, while the Atlantic Ocean has been formed as North America and Europe drift further apart. Flora and fauna: Since their appearance in the Late Jurassic, flowering plants have gone from strength to strength and have now become dominant, elbowing the ferns and cycads to one side. This has allowed a partnership to blossom between the insects and the flowers, the first pollinating insects appear at this time. Snakes are another new addition to the world. On the dinosaur side of things the Cretaceous represents a time of enormous diversity. Hazards: In the ocean there aregiant mosasaurs, smaller mosasaurs, Xiphactinus, sharks, giant squid and pliosaurs. On shore there's Tyrannosaurus rex, plus Dromeaeosaurus, a close relative of Velociraptor, which hunts in packs and have scythe like claws designed for disembowelling prey. 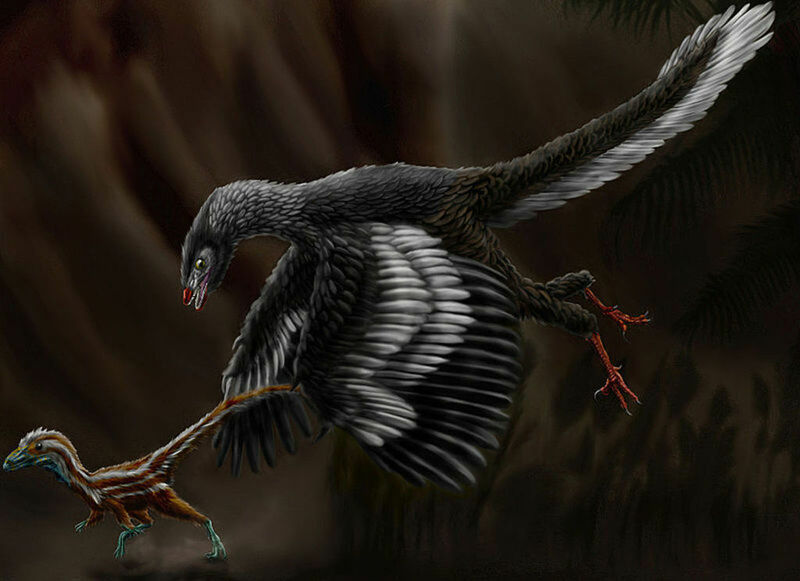 One of the so called 'toothed birds' commonly found in the Cretaceous of North America and elsewhere. Flightless and unable to walk properly, Hesperornis spent most of its time at sea hunting fish and squid, coming on to land to mate and lay eggs. Time: 80-65 million years ago. Size: 6 feet 6 inches in length. Diet: A marine predator eating fish, ammonites and belemnites. Evidence: Thus far fossils have only been found in North America. Fact: While birds might be famous for having tiny brains, the brains of Hesperornis were small even by bird standards. In my two previous hubs I profiled two prehistoric seas dominated by just one super predator, a huge marine reptile and the biggest shark that ever lived. But imagine diving into an ocean filled with not just one ferocious predator, but several, and not just belonging to one group of animals, but again several. 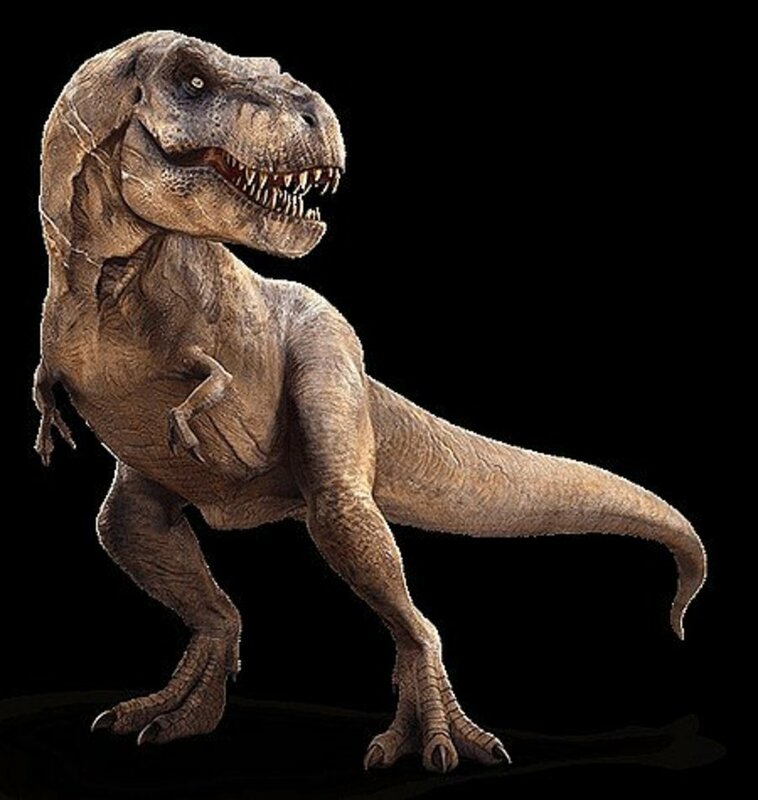 This is the Cretaceous, on land walk some of the most fearsome landlubbing predators ever known, giant predatory dinosaurs such as tyrannosaurus and its even bigger South American relative giganotosaurus, the largest land predator of all time. However, they are nothing compared with what swims around in these oceans, they are undoubtedly the meanest collection of predators ever assembled by mother nature; quite simply, this is Hell’s Aquarium. One of the best places to experience the full horror of Cretaceous marine life is Kansas. This may strike you as a little strange given that in the twenty first century this huge, flat area of land is about as far away from the sea as you can get in the USA. When most people think of Kansas they think of farming, tornadoes and, of course, The Wizard of Oz. But over the last couple of centuries the earth here has given up far more than crops, fossil after fossil of marine predators has revealed that Kansas should also be famous for its watery past; a past when the central part of the USA was completely submerged under an inland sea and most of Kansas was seabed. That’s where we need to go now, so click those magic heels and say ‘There’s no place like the Cretaceous’ a couple of times. Okay, so through the power of magic here we are in the late Cretaceous, 75 million years before the present, standing on a rocky shoreline in the very east of Kansas. To the west is the glittering expanse of the inland sea. Given that these are the most hazardous waters of all, it’s probably best not to plunge right in; we need to get a feel for where we are first. The Cretaceous is the last of the three great ages of dinosaurs. 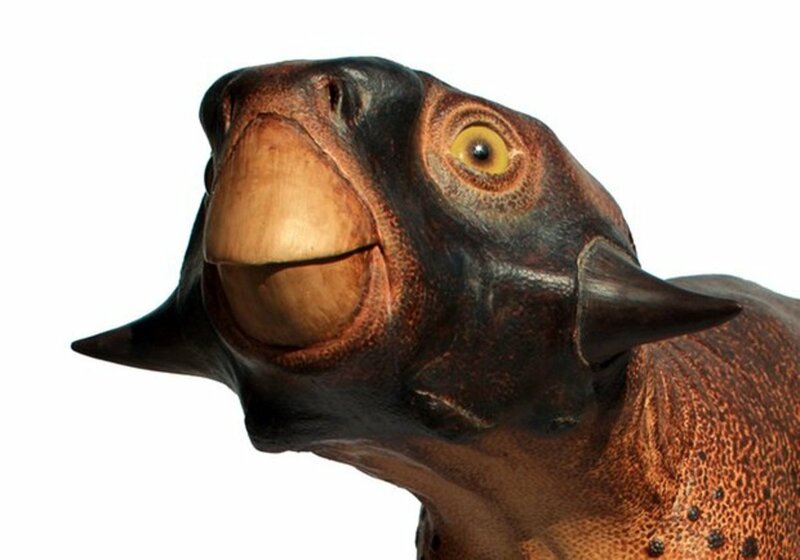 To put it in a nutshell, dinosaurs appeared in the Triassic, grew to enormous sizes in the Jurassic and then spent the Cretaceous diversifying into any number of forms before their demise (which will occur in 10 million years time). North America is a good place to find some of the best known of them; the duckbills, the raptors, the armoured ankylosaurs and good old tyrannosaurus rex. It’s quite possible to see any one of these wandering down the beach, but at certain times of year a far more likely sight is a gathering of big, rather ugly birds. Around the coasts of North America, including this inland sea, huge colonies of a seabird called hesperornis congregate to mate. The sound, sight and smell are beyond belief, now’s the time to think again. Hesperornis are nearly 7 feet long and have teeth. They are so large that they can’t even walk; instead, they slide along the rocky beaches on their bellies. The fact that they are so completely unsuited to getting around on land is something that they have to live with for the duration of the breeding season. At least they’re comparatively safe up on the beach. There may be the odd tyrannosaurus rex or raptor to worry about, but the rest of the year they spend at sea, paddling along above some real killers. Hesperornis, so useless on the shore, are built for diving, and as soon as they hit the water these birds turn from cumbersome crawlers to superb swimmers. With strong rhythmic kicks their oversized feet power them head first towards the swirling shoals of fish around the rocky shoreline. Most birds have light, hollow bones to help them fly, but not hesperornis. Like penguins of the present era, they have thickened bones to make their bodies heavier, which helps them to dive and means that they have to use less energy to overcome their buoyancy. As mean as they look, hesperornis are fairly low down the food chain. As they hunt these fish laden waters, they are constantly running a lethal gauntlet. To find out why, we need to dip our toes in the water and meet the creatures that give the Cretaceous such a bad name. Thought to be closely related to snakes, mosasaurs had extremely long tails (up to half their body length) and swallowed their prey whole. Widespread throughout the world, they diversified into an amazing variety of species, from small coastal dwellers like Halisaurus to monstrous open water predators. Time: 86-65 million years ago. Size: 10-13 feet in length. Diet: Fish, molluscs and seabirds. 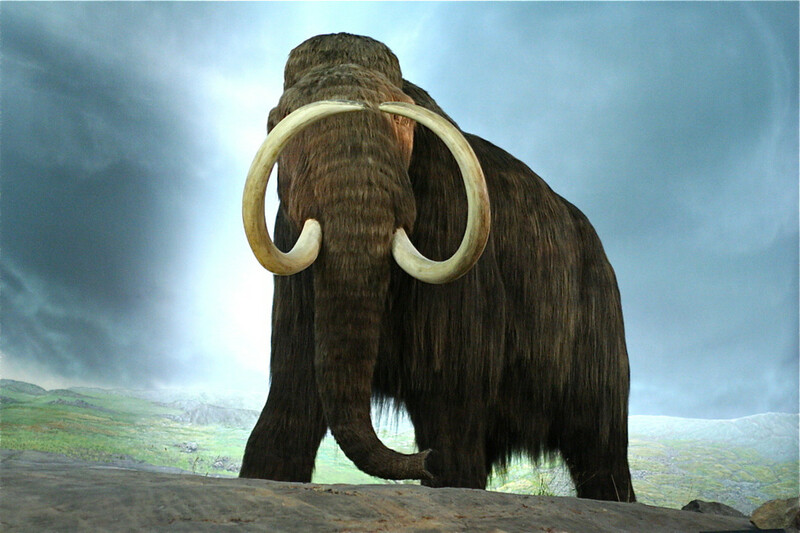 Evidence: Fossils have been uncovered in North America, South America, North Africa and Europe. 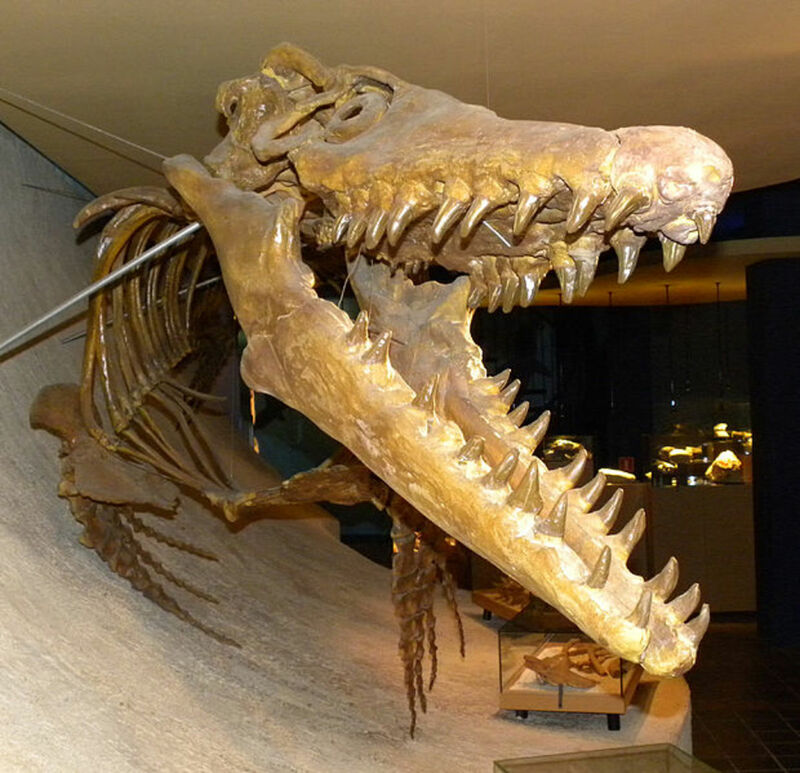 Fact: The first mosasaur fossils were discovered around 1780, almost 50 years before the first dinosaur fossils. We have said that what makes this sea dangerous is the sheer range of large marine predators around. There is, however, a recurring theme among them, many of them belong to a group of snake like hunters called mosasaurs. These formidable marine reptiles come in all manner of size and form, but without doubt they represent the ruling class in the Cretaceous predator game. Close to shore where we’re starting are some of the smaller mosasaurs. They have thickset eel like bodies and all the cuddliness of a snake crossed with a shark. These are menacing looking creatures. Some, it has to be said aren't as bad as they appear. For instance, you’d be pretty safe if you came face to face with the 25 foot long fat headed globidens. This has a mouthful of flat teeth designed for crushing molluscs. It is one of the more specialised mosasaurs and one of the few that doesn’t take large prey. But the problem the hesperornis have, as indeed you would have if you were to dive here, is that most of the mosasaurs are as bad as they appear. Loitering in the submarine caves and cracks under the hesperornis ledges are halisaurus. Some 13 feet in length, their dentition is a lot more typical of mosasaurs than of globidens. Powerful jaws sport a set of short, sharp teeth designed to grab prey and hold on to the victim during its death throes. When the hesperornis leave their rocky ledges to dive for fish, the halisaurus are down below, watching and waiting for an opportunity to get their mouth round a nice bit of bird flesh. The flesh of a tail, a cloud of blood in the water, another victim. On this coast, not many hesperornis live long enough to die of old age. Mosasaur teeth might be great for piercing the skin of their prey, but they are less suitable for slicing flesh, so once a halisaurus has caught its prey, it proceeds to swallow it. Its jaw has flexible joints within it and can open incredibly wide. Bit by bit, it ratchets the hapless prey down its throat. Extra teeth (called pterygoid teeth) on the roof of its mouth help this grim process along; they grip on to the body to keep it in position while the jaw moves forward. Mosasaurs, like snakes, eat their prey whole. Then, of course, you've got the sharks to worry about. There is nothing here as large as megalodon, which was featured in another 'Sea Monsters' hub, and won't appear on Earth for another 60 million years. Nonetheless a full range of good sized sharks such as squalicorax (otherwise known as the ’crow shark’) regard hesperornis as fair game and would undoubtedly have the same view of human being if they ever came across one. Oh, and we nearly forgot to mention the giant squid, which are between 25 and 30 feet long. Unlike the giant squid of the present day, which are never a problem for man because they like cold, extremely deep waters, these squid are shallow, warm sea dwellers. Get in a tangle with one of these and you will definitely end up sleeping with the fishes. Well, that’s the small dangers dealt with. In the twenty first century they’d probably be the top predators, but here in the Cretaceous they are merely some of the less substantial (though frequent) causes of death, the lieutenants of the food chain, if you like. To meet what we might call the generals and indeed the supreme commander we have to head further out into the open sea, where deeper water harbours more profound perils, including ever larger mosasaurs and a vicious, fast moving fish called xiphactinus. Time: 85-65 million years ago. Size: 50 feet in length, most of it neck. Diet: Small fish, ammonites, belemnites etc. Evidence: Fossils have been uncovered in the USA, Russia and Japan. Facts: The average Elasmosaurus had more than 22 pounds in its stomach. In its neck it had 74 vertebrae, whereas humans have just seven. 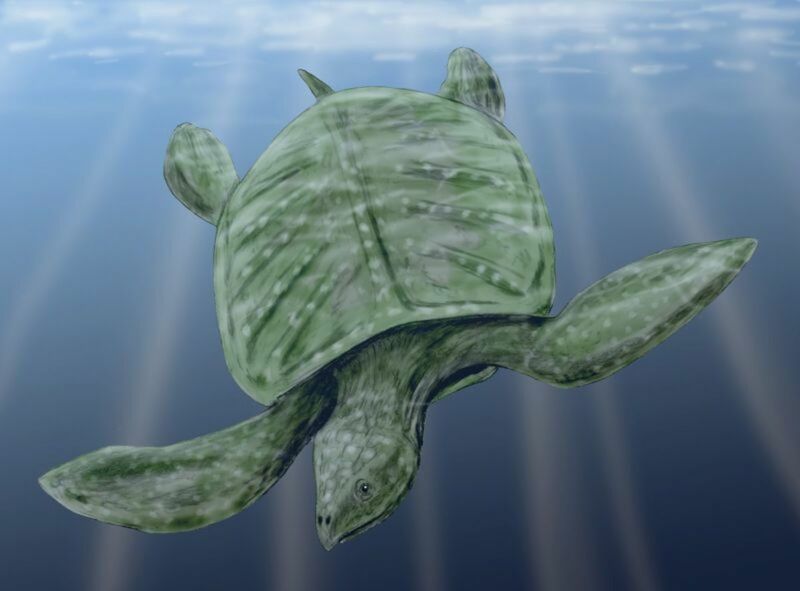 The largest turtle to have lived, it would have spent most of its life at sea eating jellyfish and ammonites and occasionally grazing on seaweed. It would have returned to land only to mate and lay eggs. Time: 75-65 million years ago. Size: 15 feet in length. Diet: Jellyfish, ammonites and belemnites, plus some plants. Evidence: Fossils have been found in North America. Fact: Archelon may well have spent several months of the year sleeping on the seabed. 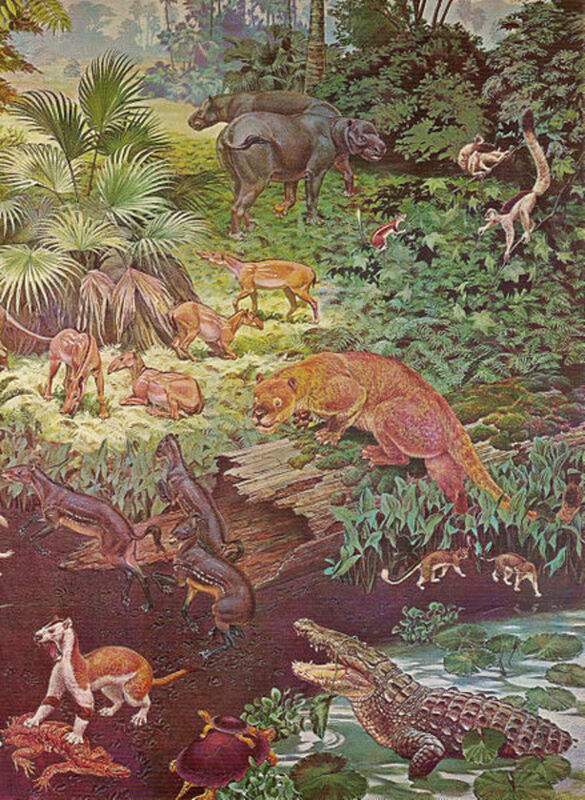 Time: 90-65 million years ago. Size: 20 feet in length. Diet: It was a pursuit hunter, chasing other large fish. Fact: Xiphactinus was a fast mover and could have jumped clear of the water as dolphins do today. Deeper water also provides a great opportunity to spot some of the other marvels of Cretaceous marine life. In a world where predators are so large, some prey species have themselves grown massive as a form of defence. 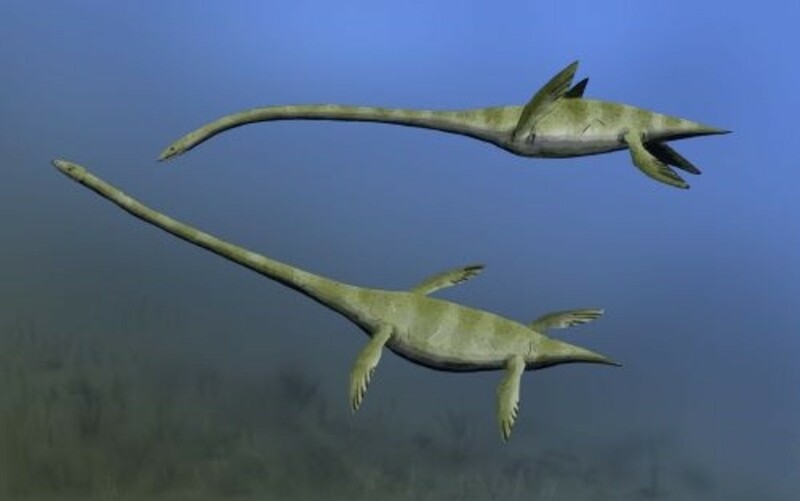 Elasmosaurus is one startling example of this; it’s one of the last species of plesiosaur and arguably the most amazing looking sea monster ever. From the tip of its head to the tip of its tail it measures 50 feet and it has the most exaggerated shape of any plesiosaur. Many species that have gone before have long necks, but elasmosaurus has taken things to a magnificent extreme. Over half of its body length is neck. But why on earth should any animal evolve such an extraordinary feature? Well, one reason is to give it the upper hand when hunting fish. 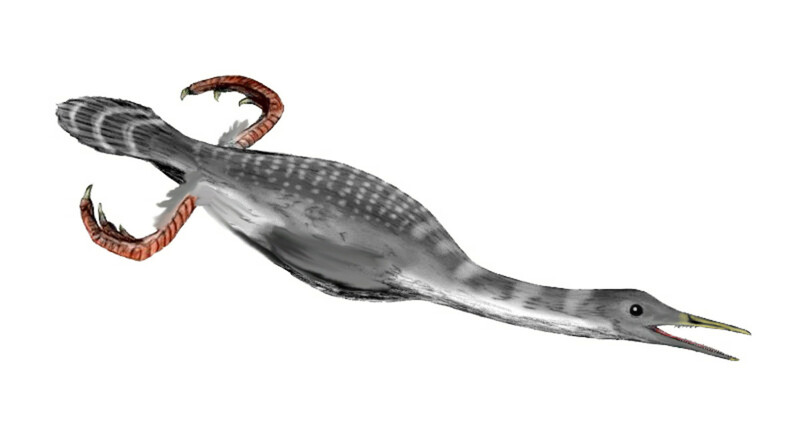 Elasmosaurus preys on small fish, and in murky water, or at dusk, it has the advantage that the fish cannot see the huge body at the other end of its neck. All the fish see is a small head which doesn’t look too threatening. By the time they realise there’s a massive reptilian body attached, they’re already inside it. To help them deal with all this fish they catch, elasmosaurus, like other plesiosaurs add a strange supplement to their diet, they eat stones. Inside the stomach of an elasmosaurus there may be as many as 600 stones, with a few weighing well over 2 pounds. Called gastroliths, these help to both grind down food and to counteract the air in the animal’s lungs, allowing it to stay neutrally buoyant. Due to the endless tumbling around inside the stomach the gastroliths get worn down and have to be replenished. Elasmosaurus travel huge distances and some even return to the same river mouth every year to literally fill their faces with rock. Another creature from the ‘bigger is safer’ school of survival is archelon, a turtle which is to other turtles what an aircraft carrier is to a fishing boat. Archelon has a flipper span of up to 18 feet, can weigh over 2 tonnes and has an awesomely powerful hooked beak, which could snap a diver’s leg in two if one were stupid enough to annoy it. To get so big, evolution has made a compromise. Archelon does not have the hard enamel shell of smaller turtles, because on a creature of this size such a shell would become far too heavy. Instead, its carapace is made of tough skin stretched over a framework of thick bone (much like on a leatherback turtle). The underside is even tougher, consisting of a thick, reinforced lattice of bone. These defences are protection against most of the predators, but tooth marks on the shell, missing flippers and the odd shattered skeleton on the seabed are testament to the fact that even archelon can fall prey here, especially to the giant mosasaurs. 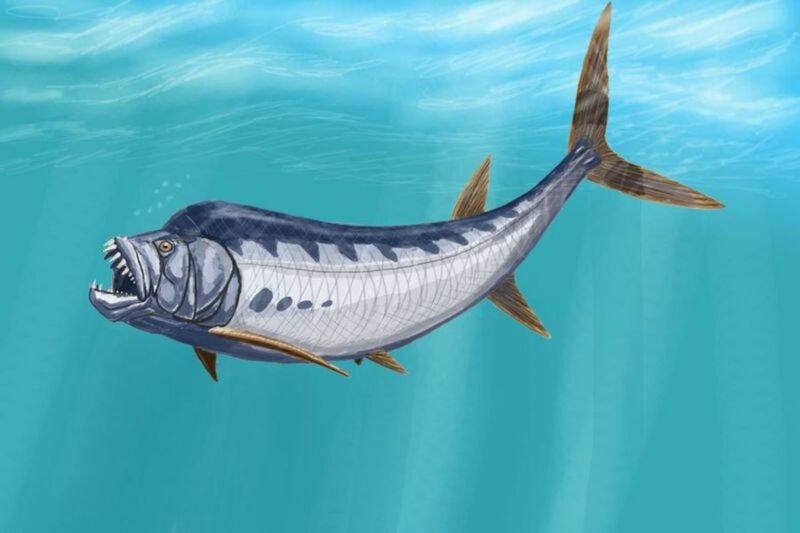 Aside from mosasaurs and sharks, there is another hellish inhabitant of these waters which, if you're really lucky, can be seen launching out of the water and crashing down to rid itself of parasites: xiphactinus, a fish that can grow to 20-23 feet long, weighs up to a third of a tonne and is as ugly as sin. One look at it and it's plain to see how it gets its nickname, the 'bulldog fish.' The huge, square down turned mouth is bristling with long, viciously sharp teeth and, like the mosasaurs,' its jaws are designed to open extremely wide to accommodate prey much larger than it really ought to be able to tackle. But xiphactinus' particular forte is high speed attacks out of nowhere. Its body shape gives it away as an extremely fast animal; it's similar to that of other ocean speedsters like swordfish, tuna and tarpon- long, deep and sleek, going to an even deeper forked tail on a narrow base. No one has ever measured the top speed of a xiphactinus, but it must be close to 40 miles per hour, fast enough that you'd have little chance of seeing it coming, and even less chance of getting away if you did. In exceptionally clear water with visibility of 100 feet or so, if it came out of the deep at full speed it would still be visible for only two seconds before it hit you. A sobering thought and another very good reason not to get in the water here. Towards the end of the Cretaceous, the giant mosasaurs were undoubtedly the top predators. The North American species Tylosaurus got towards 50 feet in length, while the largest known Hainosaurus, reached 56 feet in length. Size: 56 feet in length. Diet: Hesperornis, sharks, large fish, turtles, ammonites, smaller mosasaurs and other large marine reptiles. 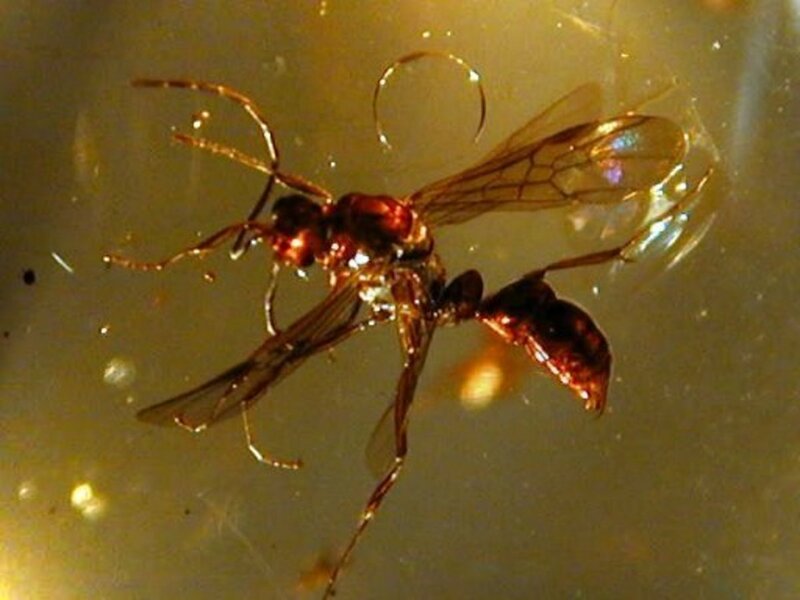 Evidence: Fossils have been found in North America and Europe. Fact: Fossil evidence suggests that giant mosasaurs ate almost anything in their path, including other mosasaurs. Of course the biggest reason of all to stay on your boat is the presence of giant mosasaurs. (In fact they are widespread all across the world.) There is something about the mosasaur design that has allowed them to diversify into species of all sizes, going from the reasonably small right up to giants like hainosaurus, which are unreasonably large. These are very much the top predators of their time, hainosaurus is the marine equivalent of tyrannosaurus rex, but a good deal bigger. Most things that are true for coastal mosasaurs are true for ocean going giant mosasaurs like hainosaurus, only on a larger scale. They have the same long, snake like bodies, expanding jaws and a habit of eating other animals whole. It’s their size that is so off the scale 50-55 feet long. At that size just about everything else in the water is on their menu, including 20 feet long sharks, turtles and even other species of mosasaur. Then, of course, there are animals at the surface of the water like the hesperornis and low swooping pteranodon, tasty snacks to a giant mosasaur. Hainosaurus in particular is not a fussy eater, but will attack just about anything. 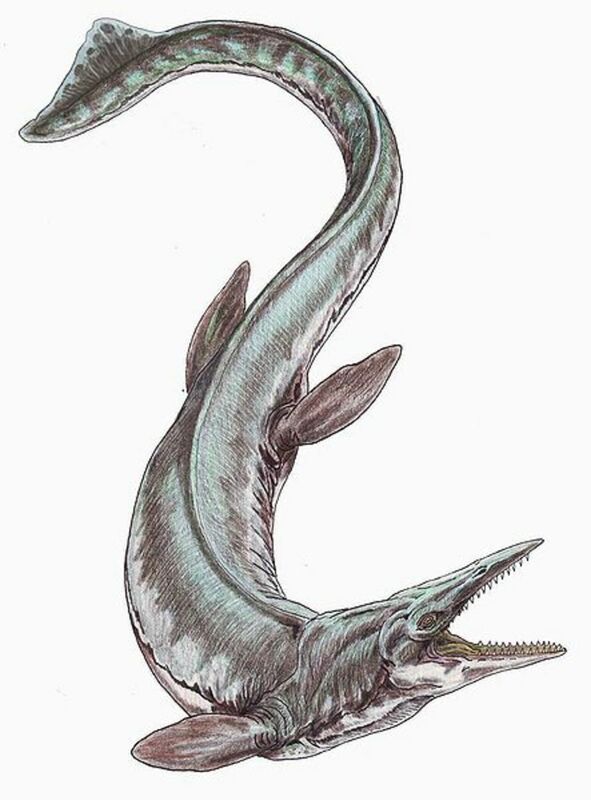 Unlike xiphactinus, giant mosasaurs are not capable of sustained periods of speed and rely on short bursts of power to ambush their prey, usually at the surface. (This is how most mosasaurs hunt, although there are exceptions; platecarpus dives deep to feed, but since it has to return to the surface rapidly to breathe afterwards, it often suffers from the bends.) Just imagine a full sized mosasaur on an attack run, an evil looking reptile the weight of a truck barrelling up from the depths, totally focused on its victim. A bone crunching impact, bodies breaking the surface and then a struggle before the prey is weak enough to be worked into the mosasaur’s stomach. Mosasaurs frequently lose teeth in these devastating attacks, but as with sharks these are constantly replaced so that the predator always has a mouthful of sharp fangs. This is interesting, but IDK about the accuracy of locations, i.e. Kansas. Does anyone else see the distinct possibility that location of fossils had a lot to do with the movement of water during the flood? Isn't it true we see huge 'fossil graveyards' which are no more than collection points for flood debris? (Assuming, of course, you believe there to have been a world-wide flood which to me seems an obvious conclusion given the tremendous amount of sedimentation, and lack of erosion between layers.) I realize this brings into question the entire notion of geologic ages, but I'm OK with that if the facts support it. Your thoughts? I really liked how that this site gave nicknames for all of the creatures then they had the scientific name at the bottom. Superb presentation. At the same time I'm reading a book titled "The Sixth Extinction" which makes a big deal over pending ocean acidification due to high atmospheric CO2 levels. Reading that book one concludes that a warm ocean would be toxic and barren. In the hot Cretaceous with really high atmospheric CO2 oceanic acidification would seem to be part of the picture. How then could there be such a varied oceanic fauna, with immense top predators implying a fully developed and thriving food chain? I've read that that CO2 in the Cretaceous was something like 1400 ppm, compared to our present (alarming?) achievement of 400 ppm due to anthropogenic causes. Hard to reconcile all of this! Does your account of a rich Cretaceous marine fauna negate the acidification scare? Great hub. Remember the walking with dinosaur episode were they visit Hells aquarium. Yes, and also virtually all of Western Europe was under water too. And nowadays its probably the most industrialised area on the entire planet. Very interesting. This period of geological time is fascinating in a gruesome way, and you made the most of that. What was also extremely interesting to me, as an American, was the fact that Kansas was under water during this time. Really hard to imagine. Now it's cornfields and farmhouses, and a very peaceful atmosphere. Thank you very much Paula. Thank you grandmapearl, nice to hear from you again.The Jurassic also holds a fascination for me, purely because of the sheer size of dinosaurs around at the time. I'd love to go back in time and see what they really looked like. Thanks again for popping by. Something tells me we're not in Kansas anymore! Awesome article, very well written, very nicely formatted and packed with tons of information. I never heard of any of these prehistoric animals; and I've always been fascinated by dinosaurs, especially of the Jurassic period. Thanks for sharing. Voted Up, Interesting and Awesome. Thank you Richard. I've always been fascinated by the possiblity of travelling back in time and simply immersing myself in the prehistoric world. But I would never ever go anywhere near the water in the Cretaceous, not unless I wanted to become some creature's lunch. Good point! After all, the coelacanth was thought to have gone extinct 65 million years ago, yet in 1938 a living specimen was discovered. Also, as well as the giant squid there's also a colossal squid which is even bigger still. Who knows what's down there? James - As always, a very interesting hub. I can see why swimming could be a little more dangerous than one would expect during this period. 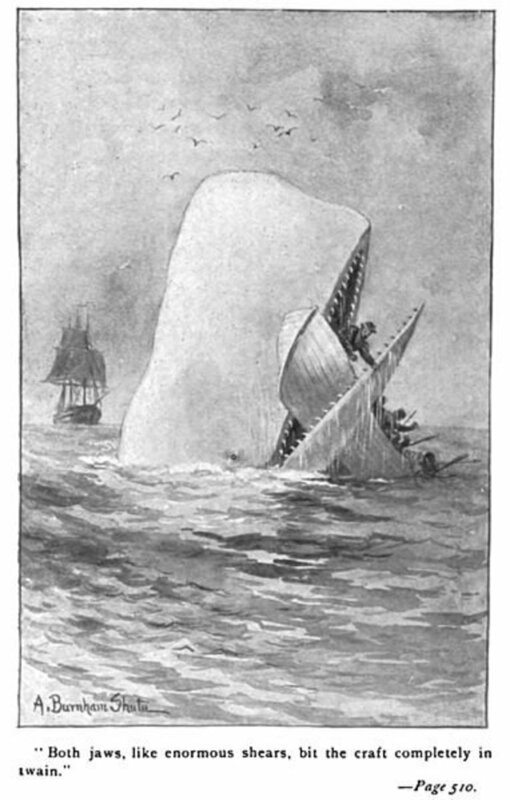 When sailing back and forth the Atlantic, one envisions what may be lurking below and only can hope for safe passage. There's simply too much that is has yet to be discovered to state all oceanic life forms have been discovered. Great Job! I dunno about prehistoric not still existing. There are many fishes in the very deep that never come up for air and live in the dark. They make their own light. We really don't know what is down there because we can only be at one place at one time and a very short time. What we would need to see more of what is down there would b some kind of submersible that could withstand the pressure for at least a month and have a camera that would take video like a motion detector on it. We are closer to those capabilities, but not quite there yet. Yes the Giant Squid does exist and it is longer that a fishing boat. Who knows what lurks in the deep? Hi there, its always fascinating to speculate on whether such monstrous creatures still exist. 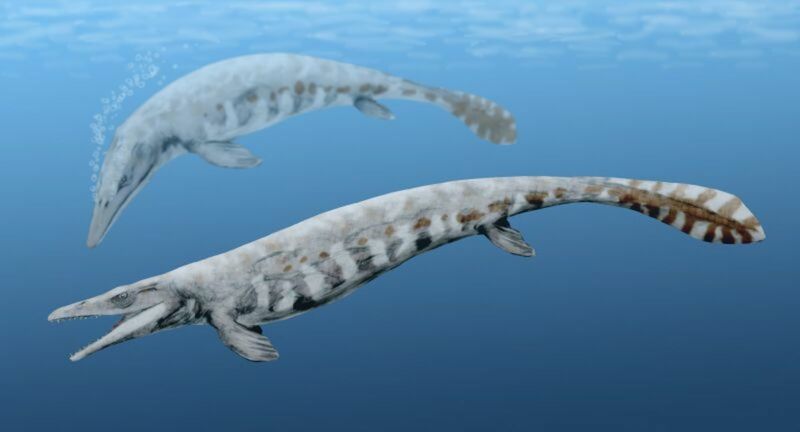 I personally think its highly doubtful that any large prehistoric marine reptile still exists, because of their need to come to the surface to breathe. But, there's always a chance that some gigantic prehistoric fish or squid still exists. Thanks for stopping by. I liked this hub. Very informative and I can see some of these living today in the depth of our waters. It would not surprise me one bit if they found something like these in the near future. Thing is with discovering anything..you just have to be at the right place and the right time and we cannot be everywhere at once. Another hubber wrote a hub on the Leviathan and it is equally interesting. I voted up and Interestng. No, although I do own one I purchased a few years ago. This one was quite pointed and short, perhaps 3/4" long. Thank you very much Mr. Archer. Did the shark tooth belong to megalodon by any chance? Well done hub! Very informative writing on a subject that is as interesting as it is diverse. I have long been interested in these creatures, and once even found a fossilized shark tooth in a rock near where I live.